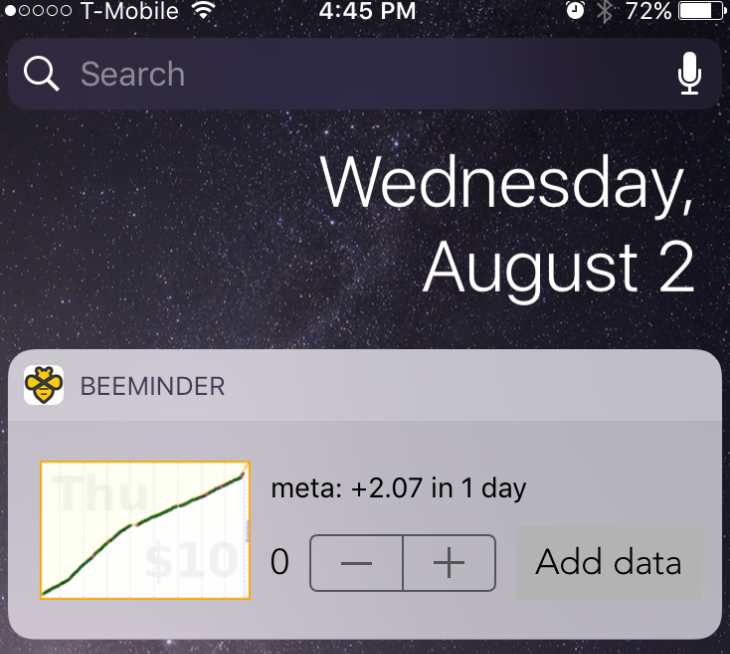 The Beeminder iOS app shows you your goals, lets you enter data, sends you iOS notification reminders, and updates data for any Apple Health-connected goals. You can also enable a widget on the Today screen that allows you to enter data. It's limited to integers, only for your most pressing goal, which may or may not be exactly what you need! Tap the +/- to adjust the value, then tap Add data to submit. 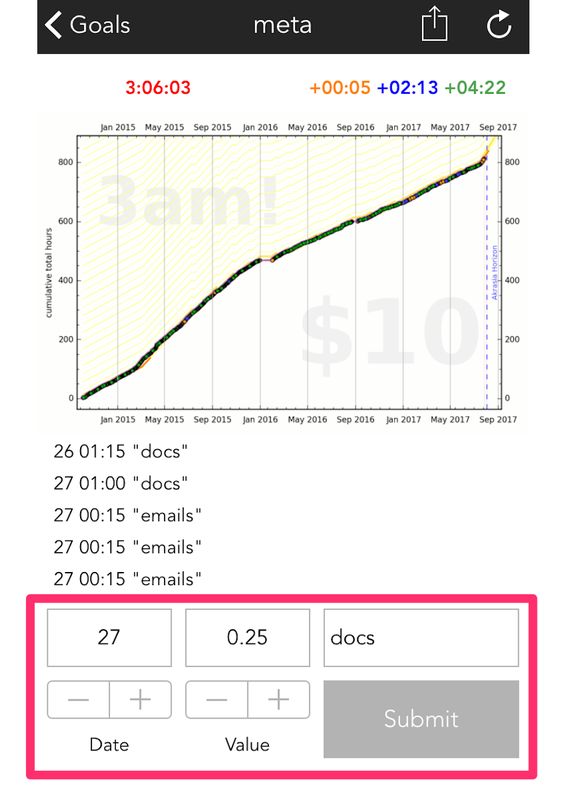 You can also tap the graph image to open it in the full Beeminder app. How do I enable iOS reminders? Tap the gear in the upper-right corner of the main screen to open the app settings. Switch the Goal emergency notifications toggle on. My iOS reminders don't seem to be working anymore. Next, double-check your reminder settings to ensure that reminders are enabled and scheduled to happen when you want them to. To refresh the goal list screen, pull down until the spinning wheel appears. To refresh a single goal, tap the ♺ icon on the upper-right corner of the goal screen. This will also fetch the latest data for an autodata-integrated goal. My Goals screen is blank and nothing is loading when I refresh. Have you created any Beeminder goals? You can't create goals using the app yet, but once you've made a goal (or more) on the site, they will load in the app view. To refresh the goal list screen, pull down until the spinning wheel appears. If the offending goals don't disappear, you can force a brand new sync by signing out & back into the Beeminder app. Finally, if neither of those work, deleting & reinstalling the app should clear them out. How do I create a goal with Apple Health integration? See the Apple Health page for more detailed instructions, screenshots, and questions about using this integration!